← GULP – MAC ATTACK !! No one knows who first created the Pavlova, but in a little known bit of literary history, legend has it that Australian writer and first biographer of American poet Ezra Pound, Nigel Stock, once sent Pound a special recipe upon request, and that ol’ Ez – then incarcerated in St Elizabeth’s Hospital for the Insane – had the recipe made for himself and several visitors to the Ezuverity. Recipes for this antipodean dessert began appearing soon after Russian prima ballerina, Anna Matveyevna Pavlova (1881-1931), toured both Australia and New Zealand in 1926, and Australia again in 1929. Anna Pavlova was considered the greatest ballerina of her time and her visit to New Zealand has been described as “the chief event of 1926.” It was said “She does not dance; she soars as though on wings.” From this you get the sense that this is a light, airy dessert. There is a controversary with both Australia and New Zealand. While it has been suggested this dessert was created in New Zealand, it has also become recognized as a popular Australian dish. Both countries claim to have invented this dessert and claim it as their national dish. 1926 – Keith Money, a Pavlova biographer, wrote in his 1982 book Anna Pavlova: Her Life and Art that a chef at a hotel in Wellington, New Zealand created the dish when Pavlova visited there in 1926 on her world tour. The hotel chef invented was inspired by her tutu, draped in green silk cabbage roses. The basic shape of the tutu was provided by a meringue case, while the froth of the skirt’s net was suggested by whipped cream. To achieve the effect of the green roses the enterprising chef used slices of kiwifruit, then known as Chinese gooseberries. 1929 – In New Zealand, a cookbook published in 1929 by E. Futter titled Home Cookery for New Zealand contained a recipe for “Meringue with Fruit Filling.” Although the name Pavlova is not used, the recipe is similar. Because of this recipe, New Zealanders claim to have originated the recipe. They say that the Australians used this recipe and called it Pavlova. 1.Use a large baking tray; line with baking paper. Mark a 23cm circle on it as a guide for the meringue. Preheat oven to 180°C. 2.In a large, dry bowl, beat the egg whites with electric beaters on high speed until soft peaks form. Gradually add the sugar and beat continuously until mixture is firm and glossy and sugar has dissolved. Beat in vanilla, then the vinegar and salt. Sift the cornflour and fold in. 3.Using a spatula, spread mixture over marked circle. Straighten sides, making them higher than the centre. Bake for 10 minutes in the centre of the oven. 4.Reduce temperature to 120°C. Bake for a further hour. Remove pavlova from oven and leave to cool completely. Whip the cream until firm; chill. 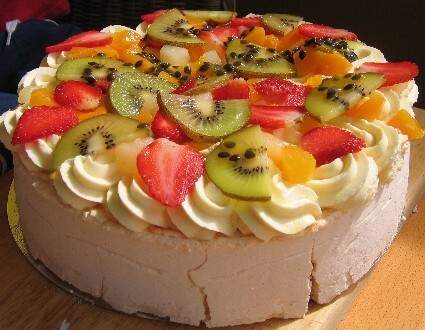 5.Just before serving, top pavlova with whipped cream. Decorate with strawberries, manderin, kiwi fruit and banana and drizzle passionfruit pulp over the top. Or, decorate with 3 peeled and sliced kiwi fruit, arranged in rounds; top with the passionfruit pulp.